These days, my flying life is all about completing the training for my instrument rating. I've been flying here and there, but the focus is all about the rating. It's not that I'm not loving the airplane, and loving flying -- I am. But that's not what it's about right now. I never imagined I still would not have the rating two years after becoming a pilot. I need to finish. As I've written before, one of my greatest pleasures is to fly someplace, argue in court, then get in my plane and fly away. I had the opportunity to do that again recently, in a court outside Detroit a couple weeks ago. A colleague, also a pilot, was also scheduled to argue, so she acted as safety pilot while I flew all the way to Detroit "under the hood." In some ways, it was too bad that I spent three hours without looking outside, because to judge by the pictures, it was a gorgeous day. 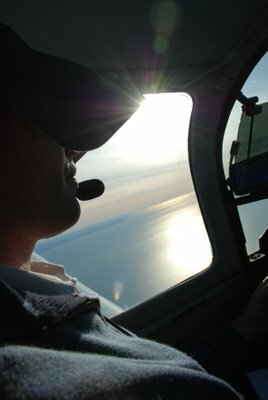 In the picture above, we were flying over Lake Erie. That was pretty cool. I can't wait for my first flight in actual "IMC" (instrument meteorological conditions) where instead of removing the hood I'm descending through clouds to see the runway magically appear right in front of our nose! I'm at a point in my instrument training where I don't need to fly with an instructor and can instead fly with a "safety pilot" in the right seat of the airplane, as I did on that trip to Detroit. Several friends have generously offered to fly with me, and I tried to take two of them up on their offers this past weekend. It was an ambitious plan -- six approaches on Saturday, and another six on Sunday. Unfortunately, it was too windy to fly on Saturday, so instead I sat around the airport cafe and was quizzed by my friend Gashaw, an instrument-rated pilot, on various things related to instrument flying. Sunday was beautiful, though, so another friend, Adam, and I took off for a long series of approaches into airports in three different states. Adam is an instrument-rated commercial pilot, working toward his instructor's certificate. Our first "stop" was Hagerstown, Maryland, where I "shot" the VOR approach to Runway 9, followed by the ILS approach to Runway 9. (In actuality, we never landed until three hours after taking off -- each time we approached a runway, we pretended that we hadn't made it to the runway and did the "missed approach" procedure.) A short while later, we were descending over mountain ridges to the west on a VOR approach to Runway 29 in Berkeley Springs, West Virginia. I have post-it notes on the walls of my office with mnemonics and acronyms for different procedures and checklists that I'm trying to memorize, and I'm reading different instrument flying manuals every night before bed (because it really puts me to sleep!). Mostly, though, I just need more hours of practice. One of the hardest parts of instrument training for me is that I miss the beauty of the world as seen from the air. Amelia Earhart once wrote, after a particularly beautiful night flight, "I have often said that the lure of flying is the lure of beauty, and I need no other flights to convince me that the reason flyers fly, whether they know it or not, is the aesthetic appeal of flying." It is not beautiful under the hood, and I have missed it. 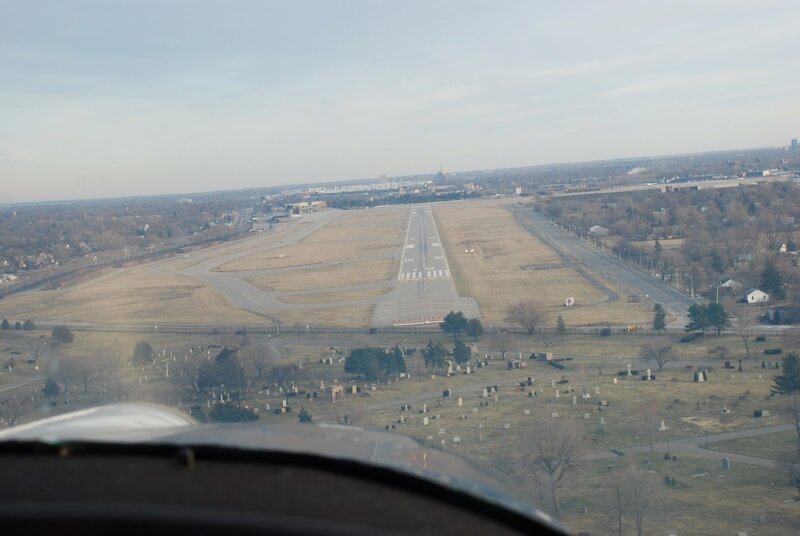 After landing with Adam, though, I took off in the Tiger again, by myself, to fly to Hagerstown, Maryland. I needed to deliver the Tiger to an avionics shop for some routine maintenance, and Adam was to follow in another plane to give me a ride back. Lightly loaded with fuel tanks only partly full and no passengers, the Tiger leapt from the runway and clawed up, quickly and with a roar, into the darkening blue sky. It was a beautiful, clear evening, and the red sun was setting behind silhouettes of mountains in the west as I climbed toward the north. Music streamed through my headset as the Tiger and I crested a ridge of mountains northwest of Frederick, Maryland. I pushed the Tiger's nose down toward the winking lights of the airport in the already-dark valley below, and could feel the speed of the air in the controls as we accelerated. The airspeed indicator crept up into the yellow arc as we dove at 185 mph across the twinkling blackness. The sun was gone as we raced up to the airport, then slowed, breathless, for the final turn to the runway. I shut off the music as I pulled the power to idle, and we gently and silently descended between the rows of lights that marked our landing. When I was a boy, my horse and I would go on long rides after school in the woods of Maine. As the sky would start to darken, miles from home, I would turn the horse's head toward home and let him go. He would race the few miles toward home at a gallop, me just a passenger, hanging on. We would pull up short in front of the barn, the horse breathing hard, and I flushed from the wild thrill of the ride. I would climb down and talk to him as I removed the saddle and let him into the barn and his stall. The Tiger is a machine, not a beast like my old horse. But as I shut it down and tied it down in the dark quiet of the airport, it felt like some things haven't changed. I nearly let the date slip by once again. Then I got an email on Saturday night from a friend and fellow pilot: "Happy 2nd pilot anniversary!" It's really difficult for me to believe that a whole year has gone by since I catalogued my flying from my first full year as a pilot. I flew 114.4 hours, compared to 61.8 last year. 78.2 of those hours were cross-country flights (with a landing more than 50NM from where I started), compared to 37.8 last year. I made 112 landings, compared to 75 last year. I carried 22 new passengers, most of whom had never been in a small airplane before. Two of them were children for whom flying is near-magic. From Maine to Tennessee, and west to Wisconsin, I flew to 23 new (to me) airports, in 7 states. Jodie flew with me almost a third of the time, 32.6 hours, compared to 14.3 last year. I flew on 11 overnight trips, some for work, some for family events, and some for vacations. I flew into Airventure for the first time, with my dad. I logged my first actual instrument conditions. Perhaps most significantly, I flew 94.4 hours in the Grumman Tiger that Jodie and I bought and own. It's a great airplane -- it's quick, comfortable, it handles well, it has great visibility. All in all, it's been a wonderful experience to have it.